.75 by almost 1.5 seems perfect size for a flake smoker. With those thick walls, this one could go to .80 though. That's all personal preference though and also depends on what kind of tobacco you prefer to smoke. So pull the trigger already! Wow--I see this one is still here. Guys--just think of how this rascal will feel clenched, and fired up with your favorite flake in it. I too say--go ahead--pull the trigger. I'll bump this one up so it sits alongside the BBBP. I could even be convinced to take 10% off for purchase of both - THAT's how marvelous things are today. Sort of. I'll give this one a tax day bump. Likes: Rotherdale and Russ H.
This is my Maddis Former-Herbaugh Apple. I have several pipes from Michael but this is my favorite of the bunch. The stem is particularly comfortable, the thick walls and larger chamber make it an absolute incinerator, it has a wide open draw, and the pipe is very comfy to hold. Though probably not intended as a clencher they work for that too. Mine is sitting in my teeth as I type this. So if you're even slightly tempted go for it. Make it your first from Michael. Shameless bump from a fellow maddis pipe enthusiast. 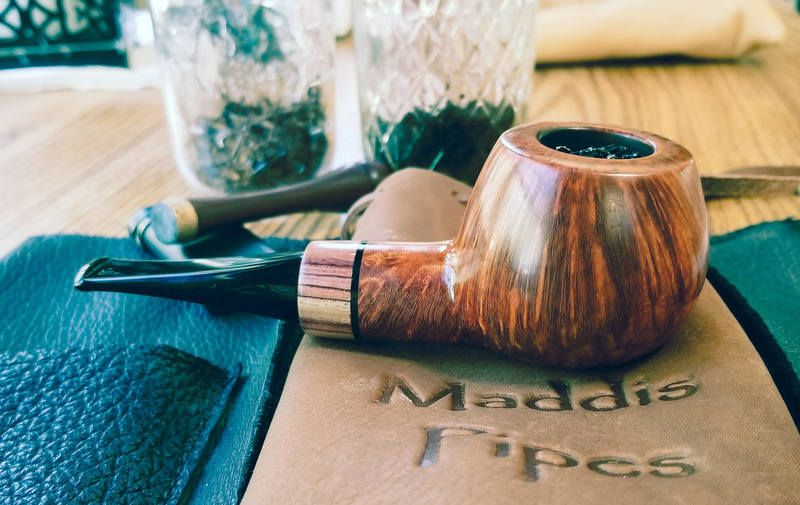 Now--I'm off to load up my stunning maddis Tom-apple with bob's Choclate Flake, and relax with a massive glass of iced tea--all while enjoying my Maddis pipe. This pipe is killing me. I have a thing for thick bowls. I have Sir Mix-A-Lot playing in my head now.